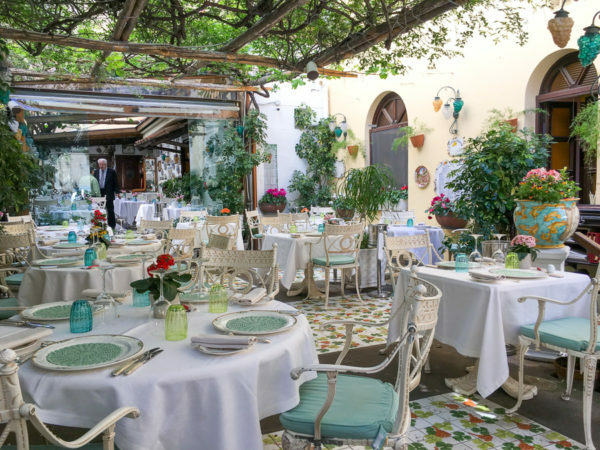 One of the most marvelous things about Italy is the quality of the food and the restaurants in Sorrento do not disappoint. Of course, traditional pasta and pizza abound for the tourist crowd looking for the basics, but fine dining and special treats are also available in abundance. Here is a (very) short list of restaurants we tried while visiting Sorrento. Admittedly, much research was done on tripadvisor.com beforehand so we didn’t just stumble upon these places by accident. While most restaurants in Sorrento open by noon, be aware you’ll most likely be dining in an empty room until 1pm or after. Italians eat lunch (and dinner) a bit later than Americans. Another great thing about restaurants in Italy is the availability of half bottles of wine. If you’d prefer rosé and your dining partner prefers red, then there’s no problem — just order half bottles. Of course, the selection for half bottles is limited but it’s Italy — wine is good. We had a delicious and reasonably priced lunch here with an excellent cheese plate, pasta pesto and Fettuccine alla bolognese. The special finish to the meal was a marvelous house-made chocolate liqueur. Chantecler’s is another (very) reasonably priced option for lunch or dinner. Don’t let the low prices fool you as the food is excellent. This quaint restaurant is located within the great hall of a 15th century renaissance patrician house located near the cathedral. The menu changes daily and is written on a board outside the entrance. For our lunch we enjoyed coscia di pollo in cassuola (chicken leg in casserole), lasagna alla Napoletana (the best! ), rigatoni with ricotta, pomodoro e basilico (rigatoni with ricotta, tomatoes and basil), and pesce serra frito (little delicate fried bluefish) which also came with a little side salad. We ordered way too much food, but enjoyed it all. Go for the beautiful gardens, stay for the delicious food. This almost-a-fantasy restaurant is situated inside, and outside, a gigantic sunroom with blooming flowers, fruit trees and fountains. They even invite passers-by to wander in and take a few photos. Our lunch here consisted of Candela al ragù con braciola (pasta tubes with sauce and rolled, stuffed meat) and Scialatielli ai frutti di mare (a short, homemade pasta.with fish). The food is really the star in this delightful and beautiful garden restaurant. Upon sitting down at our table, we were immediately given prosecco and an amuse-bouche. There’s a pre-fixe option for both lunch and dinner and although the lunch option says “light” you will not leave hungry. Our pre-fix lunch dishes were zucchini blossoms (stuffed and fried), Neapolitan style cacio e pepe, and cialda (crispy cone with double lemon cream and fresh fruit). This was probably one of the top 10 meals of my life and the service was superb and friendly. For delicious and inexpensive pizza, head to Da Franco, which is located across the street from the lemon grove. Charcuterie hangs from the ceilings and everyone sits at long picnic type tables. Service is very casual and the pizza is served on paper-lined metal trays with plastic cutlery. For each person, order the smaller size pizza (which is not very small) and enjoy the thin and tasty crust along with the superb toppings. There’s no wrong choice at Da Franco. Located right on the main piazza, Pizzeria Aurora boasts a beautiful wood fired oven in the open kitchen. We were lucky enough to get a kitchen-side table and it’s a real treat to watch the pizza makers perform their craft. The antipasto plate is superb. The previous article in this series about Italy is Denver to Sorrento – The Long Way!